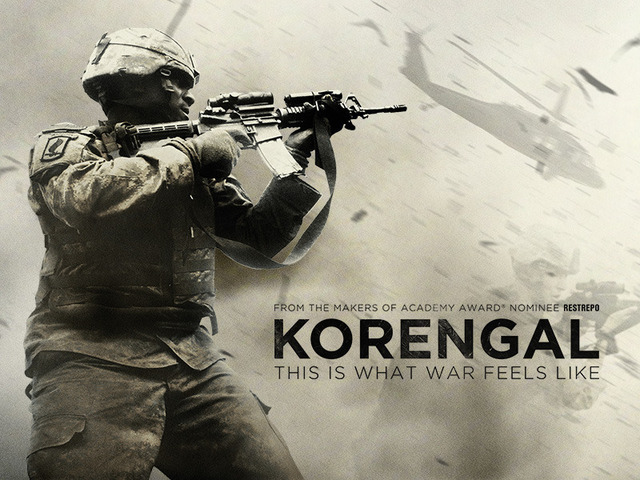 Film Review: ‘Korengal’ – An Honest Glimpse into Combat Life!! Sequels, while common among movies, are rather unique to documentaries. Korengal picks up right where Restrepo left off, with an unabashed, honest look into the lives of American soldiers in Afghanistan. 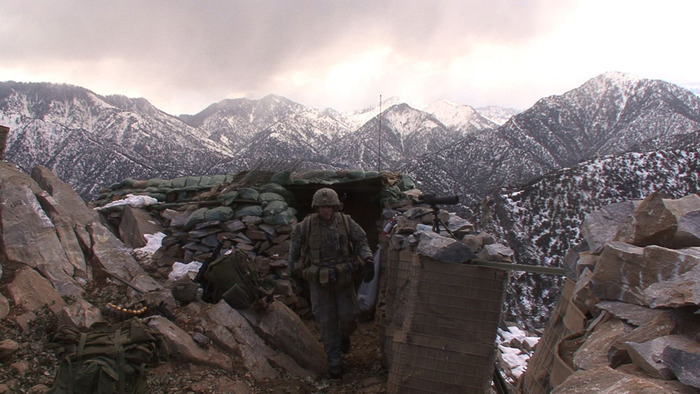 This sometimes crude documentary follows a handful of soldiers from Battle Company. To its credit, the film follows a more structured and cohesive documentary story style than its predecessor, with a more “behind the curtain” feel. Those who are familiar with the first documentary, Restrepo, will discover a film with a decidedly different tone and look. The somber, battle-focused tone of Restrepo is replaced with a more reflective, sometimes laid-back, introspective tone that contrasts nicely with the first film. Korengal takes the viewer on an introspective journey following the soldiers of Battle Company by combining emotionally moving studio interviews of the soldiers mixed with location footage that ranges as widely as the emotions of the men on the screen. The prevalent theme of fear that all the soldiers face is displayed immediately in the film and carried through to the last interview. 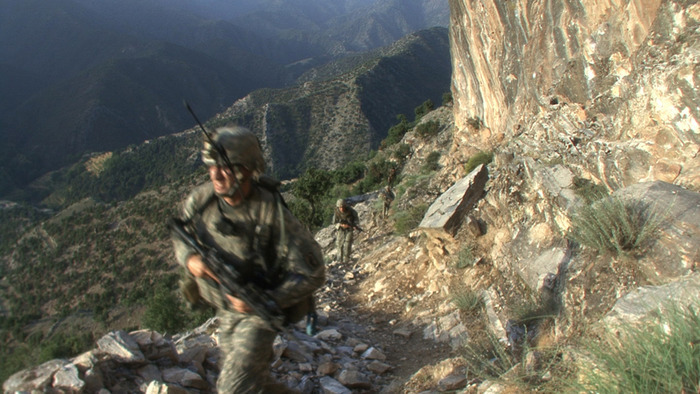 Director Sebastian Junger and his film crew eloquently display a wide variety of fears shared by the men as they do their best to survive their tour of duty in what is considered the most dangerous region of Afghanistan. The men go through their daily routines of weapon and equipment maintenance, patrols, and various downtime activities as they reflect upon what frightens them the most. The most moving account shared by all the men emerges from these common threads of fear is that of brotherhood. The juxtaposition of themes from fear to brotherhood creates within this film an uplifting sense of comradery amidst all the uncertainty. Time again, the soldiers each reflect upon their strong desire to go home to their families and escape the horrific experience that is Korengal. Yet, to a man, they express their unwavering support of one another in the declaration that they would return in a heartbeat and do it all over again if it meant they could do so together. This sense of a bond “stronger than family” that these men shared is the true essence of this film and is expressed to the viewer so powerfully that the viewer almost feels a ping of jealousy for an inability to share in the emotion. Junger begins the film with a question asked to the men to get the ball rolling, and from there takes a back seat to the men, allowing them to tell their own story. In that regard, the film loses its traditional documentary style in favor of a more voyeuristic approach. While this might otherwise lead some films astray to get lost in a random hodgepodge of film footage, it really works for this film and its subject matter. The viewer really gains a better feel for the brotherhood that the soldiers cling so dearly to. This style also allows for the viewer to see the daily routine of the soldiers more clearly. The monotonous boredom the men face is depicted succinctly in the footage as they go about looking for things to pass the time. The audience is told it is not uncommon for arguments such as “who would win in a fight: Fabio or George Clooney” (a fair question) to last for hours. The men play music, sing, talk, lay around, and do their best to try and deliberately annoy one another. This downtime that drives the men crazy is contrasted with the occasional harrowing assault of gun fire that literally lasts for only a few minutes before quieting down again back into the boredom. This realistic depiction of life in a warzone is something not seen in most films clamoring for more “Hollywood appropriate” wall-to-wall action. 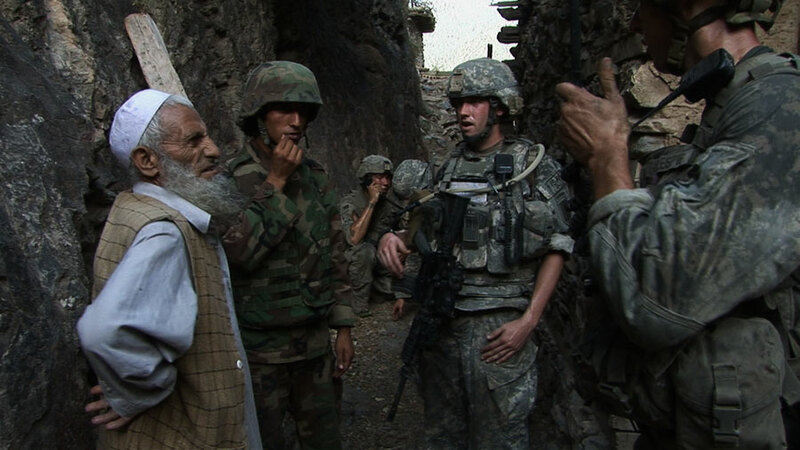 One of the most unique aspects of this film that really sets it apart from other war documentaries is the display of the dichotomy between the trust of the soldiers and the villagers they are trying to protect. The film crew follows closely as Captain Kearney repeatedly attempts to establish a report with the local villagers in an attempt to gain their trust and assistance. But, as several soldiers (and even Captain Kearney himself) admit, these attempts are a double-edged sword. This brutally honest depiction of ground-level diplomacy offers a fresh perspective that few other films have even attempted. If one negative could be made, it is that the quality of the videography could use a little work. The interviews in studio are masterfully done, as is most of the location footage. However, there are times when the camera resembles that of the nauseating POV work of films like Cloverfield. While this gritty style would work well during the combat scenes, it brings down the overall quality of the film when shown during those scenes of downtime boredom. It is not necessary to first view Restrepo in order to follow this film, however, the underlying compassion and sense of lose the men share from the first film will undoubtedly be lost in this film as little effort is made to explain the impact over the loss of men like Juan ‘Doc’ Restrepo and others. Do not go into this film expecting to see firefights, bloodshed, pro-American sentimentality, or any other typical action movie cliché. Those that do are missing the point of this film. The fighting is there, but the emphasis is on the emotional and mental impact their tour had upon these men. In that, this film succeeds beautifully. This entry was posted on Thursday, June 12th, 2014 at 2:14 pm	and is filed under Film, News. You can follow any responses to this entry through the RSS 2.0 feed. You can skip to the end and leave a response. Pinging is currently not allowed. « Michael Keaton in ‘Birdman’ Is AWESOME! !